Another wet day down at Derbyshire's favourite branch line did not deter our visitors with over 300 passengers enjoying at trip along the valley in our royal two car train. Even through a wet train window, the autumn colours still look picturesque. My thanks go to the train crew today who looked after our visitors so well and a special mention to Julie Ball who is now selling souvenir 150 brochures on the train as well as distributing Santa Special leaflets. Julie did a great job today. Supporting today's service was the miniature railway, EVRA shop, Pullman Buffet and Booking Hall staff. Thats all from me as Strictly is just starting! I can't believe it is nearly the end of the month already! Today we hosted a Bronze Drive a Diesel Railcar experience which was enjoyed by both participants. One of them was from the USA! In fact, speaking of the USA, another chap who is British but moved to America some years ago was on holiday here and had put a request in to photograph The Duke. We obliged although of course there is only the frames to see really. The Commercial Dept spend the day getting over the stresses of the website going down yesterday morning. It seems some software had been updated on the server (not by us) which caused errors on the site. We were able to get most of the site back fairly quickly but it took much longer to sort out the Online Ticket Office. Happily we think it is mostly resolved now and I am grateful to Robin for his remote technical support from Stockport (or somewhere like that). This 'little' issue took around 8 hours of his time to sort out! I guess the biggest news of today is the demise of the former north weighbridge. 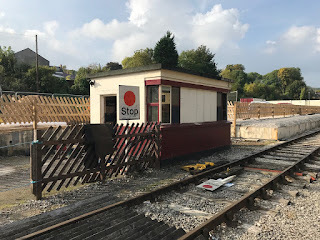 Built in the 1960s to weigh the stone wagons before they went off out of the yard, it started life with us as a workshop but has more recently fell out of use and with the weighing equipment long gone, became a store. 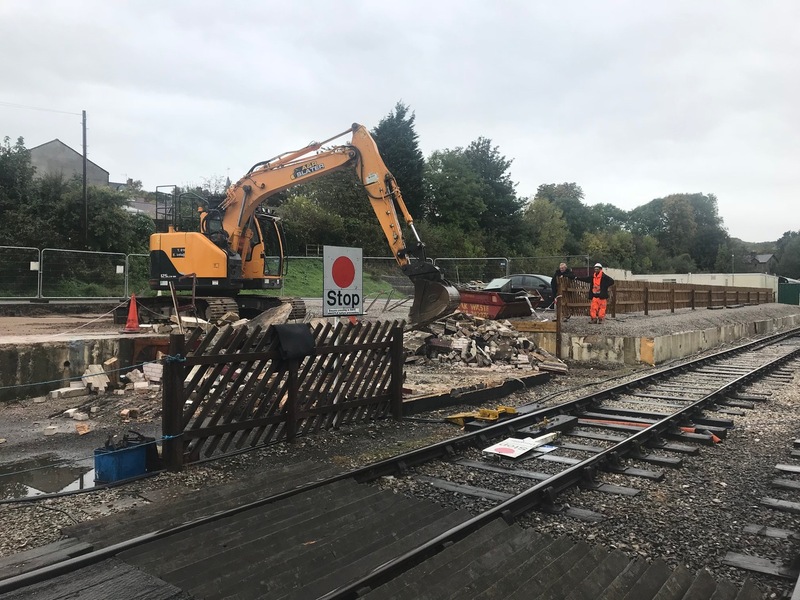 It was in a deteriorating condition and it needed to be demolished to make way for the eventual new station building. I was expecting it to put up quite a fight as we have tried drilling the bricks before and found it very tough, however, one smack to the concrete roof and it collapsed in just a second! I suppose on one hand it is a bit of the railway's history confined to the scrap bin but on the other hand it has already vastly improved this area and will make way for something much bigger and better. Before and after photos attached. The final Thursday operating day of the season saw reasonable loadings for this stage of the season. The sun was shining which did help! The PW team were out down the line continuing with the seemingly never ending quest to maintain the track and the Maintenance Team were looking into an ongoing issue with fuel supply issues on 50253's No1 engine. Seems there might have been a pipe which had tight fittings but was loose inside them. The usual quite Wednesday at the EVR with the PWay taking the works train to Shottle early in the morning followed by 55006 going empty stock to Duffield to collect a group of Syrian refugees/Ayslum seekers being looked after by the Derby Refugee advice centre. They had refreshments at the Community garden Centre and visited the Town. We returned them to Duffield at 1615. They all seemed very appreciative of our hospitality. Our two Barclay steam engines were being winterised after their summer stints. Cathryn's steam distribution manifolds are being refurbished with a lot of heat and grunting !! Today was Derbyshire Day organised by BBC Radio Derby and we were all too delighted to take part. 360 complementary tickets were offered to the BBC and all were taken by pre-booking via our website. The day was a great success with many local residents taking advantage of the offer and seeing what we did. I'm sure many will be back in the coming months and maybe even for Santa. We had plenty of coverage both live and recorded on the radio today, with Sally Pepper paying us a visit. 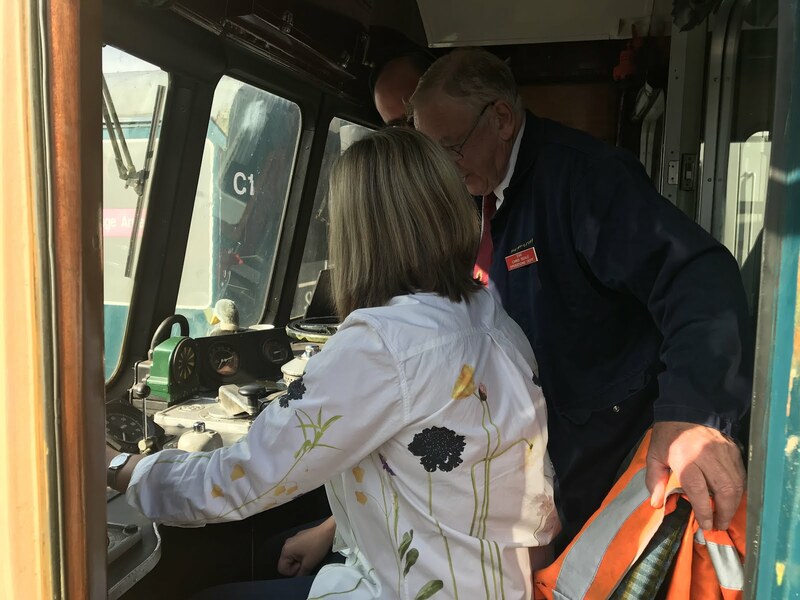 She started off by having a quick lesson on driving a DMU before interviewing staff and visitors. As a supplement, the Miniature Railway and our retail sales did well from the additional numbers of guests. Down the yard, the new CCTV system was being installed around the Maintenance Facility upgrade works that have been taking place in that area. The Faraday team were here too although it has been too busy to find time to pop down and find out exactly what has been happening! 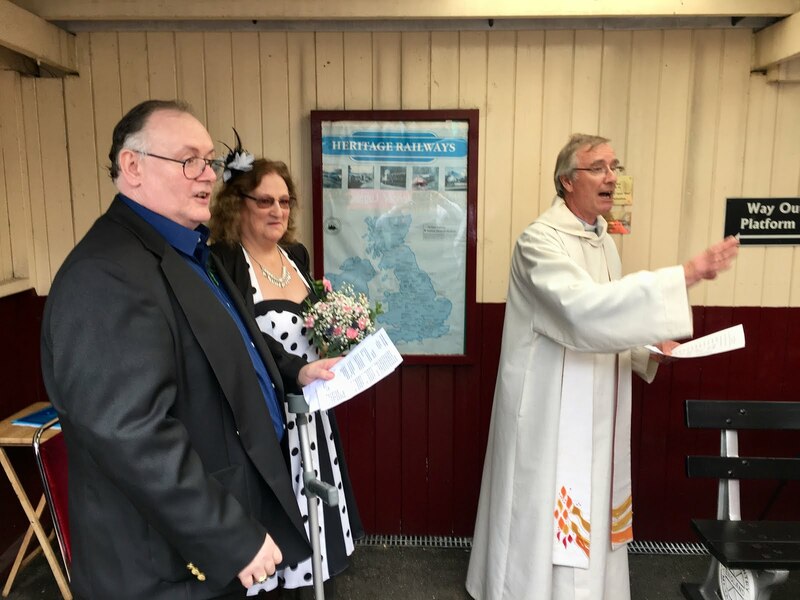 Thankfully we saw some sunshine later in the day which was a blessing for our wedding guests who attended a celebration of marriage on platform two. The wedding blessing was performed by our very own Robert Harris who did an excellent job. Our guests enjoyed a trip along the valley which is now a myriad of autumn colours then joined the Pullman Buffet team for refreshments. Our congratulations to Dennis and Shiela on renewing their wedding vows. Who said railways were not romantic? John H-T and Jo looked after our footplate experience participant and John B looked after his family of very excited children who enjoyed the brake van rides. Our wedding party also enjoyed some trips up to Ravenstor. 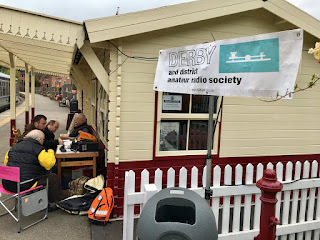 Down at Duffield Derby District Amateur Radio Society has set up a temporary radio station and were broadcasting to other railway radio stations throughout the UK. Down the yard the DMU team undertook a shunt of the coaching stock before carrying on with the restoration of the Derby Lightweight together with some welding on Faraday. Todays service was supported by the booking hall staff, EVRA shop and miniature railway. Tomorrow promises to be an exciting day as we host another celebration, Derbyshire Day. With 320 tickets already pre-booked each train will carry over 120 passengers. BBC Radio Celebrity Sally Pepper will be broadcasting live from the railway throughout the day. The weather forecast looks promising for a change so we could be in for a real treat. A damp and miserable day in the valley but it didn't deter the passengers, with the 2 car DMU full and standing on the first train from Duffield earlier. This was partly due to a pre-booked party which were also booked to have an afternoon tea in the Pullman at Wirksworth. This they enjoyed so thank you to those volunteers who stepped in to lend an additional helping hand with serving this. Down the yard, some shunting and fuelling was done ready for a busy weekend coming up and the PW team were trying to tidy up Road 1 after the relay last weekend. Unfortunately, the weather hampered their progress somewhat so they came to a frustrating early finish. Much better progress was made though in the S&T department who are using the shelter of the new Maintenance Facility to fabricate and construct further signalling for Shottle which should enable the former Oddingley box to be commissioned in the future. Today saw the last Tuesday service train hauled by a diesel loco which gives our coaching stock a well earned rest and time to catch up on maintenance and repairs. Trains ran today to the Blue Timetable with the Royal Railcar doing the honours. A coach party enjoyed a ride too with a prebooked afternoon tea in the Pullman. Not a bad day in all, with the train acting as the taxi back to Duffield for the University of Birmingham students too. Down the yard, the PW tidied up after the visit of the students and work continued on the Derby Lightweight power car. Also being restored is stalwart shunter Faraday. It has had a new cab sheet welded on and now it is being filled and primed (photo attached). Train services were operating yesterday to the Blue Timetable which was capably handled by 55006 although good loadings were seen throughout. The buffet did a couple of static afternoon teas for people who had missed the on train offering that has been taking place during the summer and the Commercial Department did some more ordering for the shop. Sales of the recent delivery of jams, pickles and honey have been very strong in the first week with 11 jars being sold on Tuesday alone! Down the yard, the PW were spending time at Wirksworth dismantling part of Road 1 in the yard. This part of the yard is the only road which has never been relied since we started and whilst it wasn't quite ready for doing, it will prove to be a most useful task for the students from the University of Birmingham this weekend. You may remember that we get a cohort of MSc students, many of them from overseas, who are studying Railway Engineering at the University of Birmingham each year for their induction weekend. They mostly undertake track relaying and this year is no exception. So, on Thursday and Friday the PW team came to Wirksworth to dismantle the old track. The local farmer assisted too by scraping away the years of spoil under the track with his mini digger and taking it away with his tractor. The students will then relay around 4 panels this weekend with new sleepers and ballast. Today we hosted another Bronze Drive a Diesel Experience for four guests. The day had to be worked out logistically to achieve what we needed to do and happily it went smoothly. They collected the water tank wagon which has been outstationed under Duffield tunnel all summer as a steam engine backup supply and brought it back to Wirksworth with the 31 this afternoon. 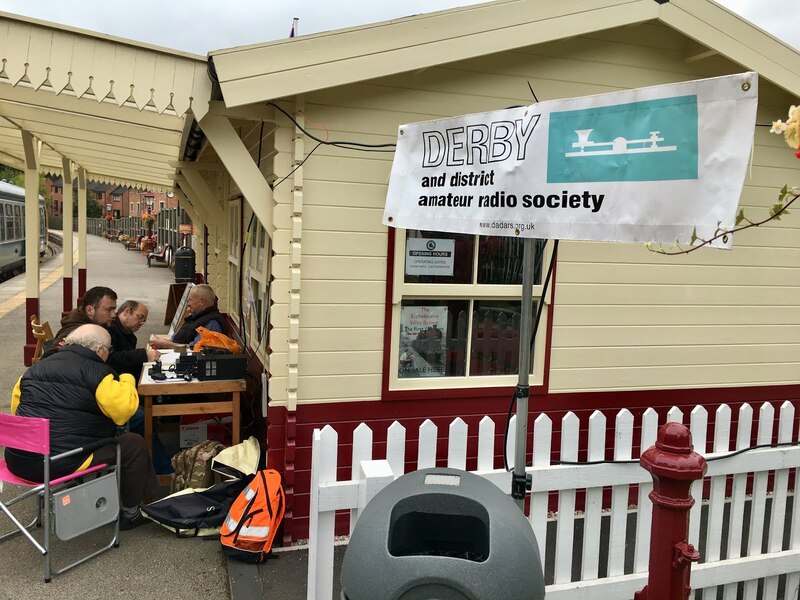 Once the experience had returned to Wirksworth a charter ran to bring up (or that should be technically down) the students who had arrived at Duffield by train, as they stay over in Wirksworth for the weekend. There were other teams on site today too, with work continuing on the PW Bubble's body work and some more interior stripping of the RF kitchen car. As I was leaving to go to Duffield with some shop stock and to check all was ticketyboo with their retail empire, it looked as though the evening shift were arriving to work on Faraday in the shed too. A wet and miserable day for Wirksworth Festival saw the final incline services of the season. The day started off very quiet indeed on the trains but built up to the grand finale on the 16:00 service as we hosted two coach parties and 32 brave souls who had walked from Duffield along the Ecclesbourne Way on that train. Fortunately, they were able to warm up with a nice cuppa in the buffet before the journey. One of the coach parties had pre booked a light lunch too so thank you to the buffet for looking after both parties simultaneously. The Miniature Railway did alright considering the weather, with them benefiting from some festival goers who didn't want to ride on the big train. The car park was busy all day and with the absence of anybody manning it, it was down to the Booking Office to sell the parking tickets which worked quite well. The Wirksworth Festival weekend is the only weekend we charge for car parking at the moment and it is redeemable against travel. Down in the sheer luxury of the Maintenance Facility, Faraday was again being worked on with one of the owners seen with a rather large tub of filler first thing this morning. I am assuming that work has also taken place on the Derby Lightweight power car and RF kitchen car because the usual suspects were around, although I haven't managed to catch up with them to find out what happened. Slightly less manic than of late but with passenger numbers still being of a reasonable level for the Thursday service, especially in the morning before the weather deteriorated. Down the yard, the Maintenance Team virtually completed the exam on the Bubble Car. Today we hosted a Bronze Drive a Diesel Experience. The participants loved it! They used the Royal 2 Car DMU this morning to give that it's first trip down the line since May and then the Class 31 in the afternoon. They used the time on the 31 to shunt out two Rudd-type wagons and a tool van from Shottle sidings and trip them up to Wirksworth for a job which is coming up. The Station Team cleared out lots of stuff from the north weighbridge with mostly PW bits left now. They discovered a panel heater behind a draw unit which was on and had probably been on since Noah was a lad! Reasonably peaceful at Wirksworth for a change, with just the Maintenance Dept preparing the DMUs for service again after a break in the summer. Down the line the PW team split in two where one half greased fishplates north of Idridgehay and the other changed 10 sleepers north of Hazelwood. A pleasant day in the valley for the penultimate day of Class 26 action. It was reasonably busy too with a good party of enthusiasts coming by mainline to catch the train at Duffield. Down the yard, work continued on stripping out the interior of the RF kitchen car and the LMSCA were attempting to secure the windows in their Brake Third coach. This evening, we hosted another very successful Tunes and Chips Evening Land Cruise with music courtesy of Saxaphonix. They were great! An enjoyable evening was had by all. So we fling ourselves in to September with the final Friday of the season as we primarily did these during the school holidays. We have never done Friday's before but we decided to give them a go instead of Wednesdays because we found that Wednesday was the quietest day of the week and the town did half day closing. Friday's have happily been busier than Wednesdays although aren't quite as established as Tuesdays and Thursdays. Today was being ran by the visiting Class 26, which has tomorrow and Sunday to go before it moves on to the GCR for their Diesel Gala. There weren't that many more volunteers on site. The Station Team fixed the cover which goes over the water tap so that it doesn't freeze when winter arrives and the maintenance apprentice was working on the radiators for the PW Bubble.